“Triumph of Great Britain” is one of the oldest makers of two wheeled vehicles in the world. Started making bicycles as the Triumph Cycle Company in 1889. In 1898, Triumph extended its production to include motorcycles and by 1902, the company had produced its first motorcycle, a bicycle fitted with a small Belgian-made engine. In 1904, Triumph began building motorcycles based on its own designs and in 1905 produced its first completely original motorcycle. By the mid-1920s Triumph had become one of Britain’s main motorcycle producing 30,000 motorcycles each year. By 1939, the 500 cc Tiger 500, capable of 100 miles per hour was released. To satisfy the American desire for more long distance riding, Triumph turned out the “Thunderbird, a 650 cc version of the Speed Twin design. The Triumph brand got a lot of publicity in the United States when Marlon Brando rode a 1950 Thunderbird 6T in the 1953 film “The Wild One”. 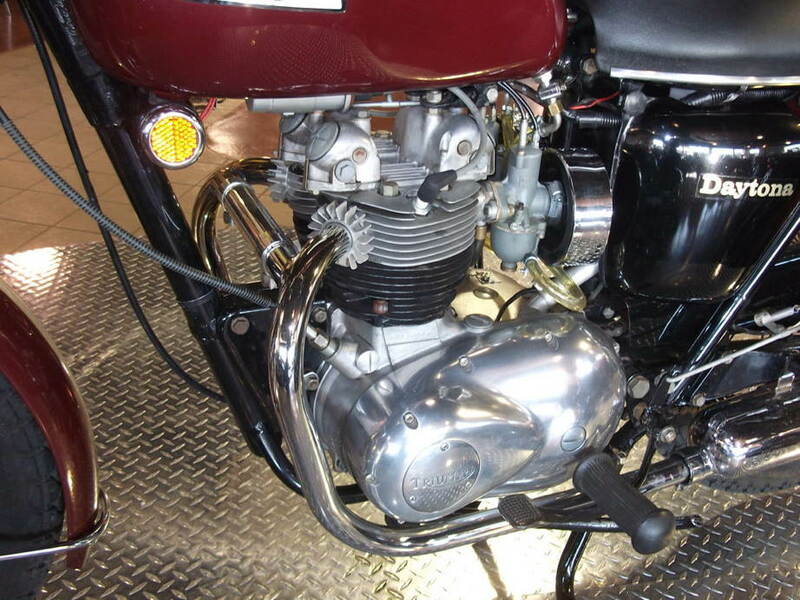 In 1959, the T120, a double carburetor version of the Tiger which came to be known as the Triumph “Bonneville”. In “The Great Escape” (1963), the famous motorcycle jump over the fence performed not by Steve McQueen but by Bud Elkins, was done on a ’59 Triumph TR-6 camouflaged as a war bike. In the 60s, Triumph began to excel in racing. In 1969 Malcolm Uphill, riding a Bonneville, won the Isle of Man Tourist Trophy race with an average speed of 99.99 miles per hour. By 1969 fully half of the US market for motorcycles belonged to Triumph, but, inevitably, technological advances from competitors marched on and Triumph failed to keep up. Triumphs lacked electric start, relied on out-of-date push-rods engines rather than overhead cams, vibrated and famously leaked oil. Japanese competitors such as Honda were building more advanced features into cheaper, more attractive machines. 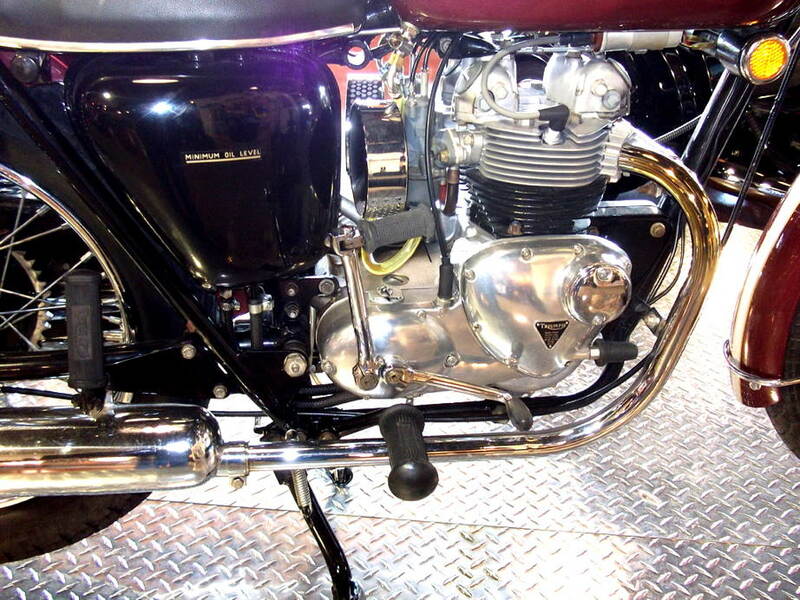 Triumph’s manufacturing processes were very labor-intensive and inefficient. Inevitably, Triumphs became obsolete quickly. The British marques were poorly equipped to compete against the massive Japanese financial resources that targeted their competitors for elimination via long-term plans subsidized by the Japanese government. Triumph and other British bikes like BSA and Norton created variations on their previous themes, but were insufficient to counter the wave of Japanese bikes flooding the USA. The original Triumph Company in Meridian, UK went into receivership in 1983. Residuals of the original Triumph team visited its competitors’ facilities in Japan in 1985, determined to find a way to get back in the game competitively. They became especially interested in the new-generation computer-controlled production machinery. By 1988, the company had moved into a new factory site in Hinckley, Leicestershire, UK. In March 2002, the Hinckley facility burned to the ground and by 2006. Triumph had relocated into a new ultra-modern plant with cheap labor overhead in Thailand. September 2008, Triumph announced that they were expanding their Thailand factory to increase capacity to over 130,000 motorcycles per year. Modern Triumph motorcycles are well made, stylish and get good reviews for design and safety. 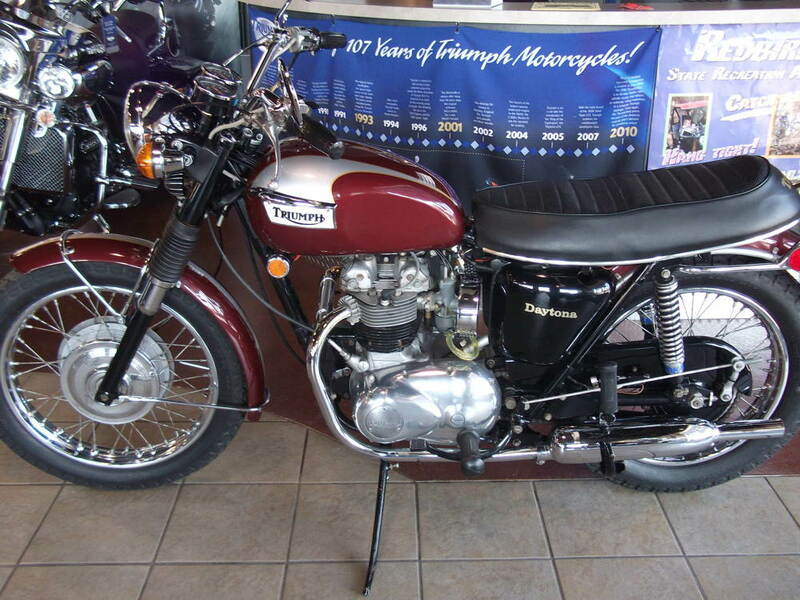 The vintage Triumph motorcycles are considered strong collector’s items as they appreciate in value while still being functional if kept in pristine condition. Of all the array of collectable Triumph motorcycles, the two that lead the list are the early 70’s 650 cc Bonneville and the 500cc Daytona. The ‘Daytona’ name was derived from American racer Buddy Elmore’s win at the 1966 Daytona 200 race, with an average speed of 96.6 mph on a 500cc Triumph Tiger T100, the precursor to the T100R that I now own. As the aesthetics of motorcycles go, I think the 70s Triumph Bonnevilles and Daytonas rank in the upper reaches, and they are very rideable for limited uses. The Daytona of the early 70s (ended production in 1974) was truly a thing of mechanical beauty. I am lucky to have found this one in another Midwest city. The 500cc engine puts out only 40 horsepower, the same as a Volkswagen Beetle of the same era, but it’s plenty enough for riding around town on nice days. It has drum brakes, but the bike only weighs 370 pounds wet so that’s plenty for occasional riding. An Antique license plate avoids inspections and the insurance is a hundred bucks a year. There aren’t many of them around. This one is a ’72 and has been aggressively restored from the ground up by professionals. 10,000 miles on it. Check out the photos and see what you think.